QUITO, Ecuador, April 17, 2016 (ENS) – The magnitude 7.8 earthquake that struck Saturday night off the west coast of northern Ecuador has killed at least 272 people, a death toll that will “certainly rise,” according to President Rafael Correa. 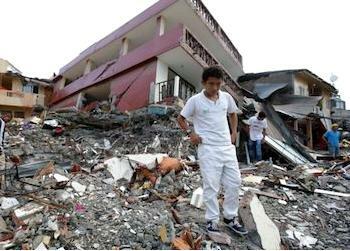 In addition, over 2,500 people were injured in the quake that has generated more than 180 aftershocks. generated more than 180 aftershocks. Roads have been damaged, bridges have collapsed, and power supplies have been affected. Late Saturday, on his arrival back in Ecuador after cutting short an official trip to the Vatican, President Correa signed an emergency decree and mobilized some 14,000 army and public security personnel to the quake-affected areas. The devastation prompted neighboring Colombia, and nearby Mexico and El Salvador, to rush in rescue teams. But Correa said the quake had “destroyed” the city of Pedernales. Buildings, including tourist hotels, have collapsed. “There are lots of dead bodies,” Pedernales Mayor Gabriel Alcivar told local media. Vice President Jorge Glas is in Pedernales saying that the priority is to help the injured and to continue searching for survivors trapped in the rubble. The search for survivors has not been in vain. On Sunday afternoon, 20 hours after the quake, a girl was rescued alive from the rubble of a building in Pedernales. Today, Glas visited the quake-hit cities of Manta, Pedernales and Portoviejo, in the northeast province of Manabi, an area of damaged highways and landslides. The president flew into the quake-struck city of Manta today for a firsthand look at the damage and response. In the city of Portoviejo, 15 kilometers (10 miles) away from the coast, the quake destroyed walls in a prison, enabling the escape of 100 inmates. About 30 have been recaptured, some returned of their own accord, and police are searching for the others. The inland capital city of Quito suffered only power outages and cracked walls, and officials said the country’s oil facilities appeared undamaged. “Depending on the number of health facilities affected there may be urgent needs around maternal and obstetric care. We should also expect urgent needs around food, water, sanitation and shelter,” said Walter Cotte, the Americas Regional Director for the International Federation of Red Cross and Red Crescent Societies, which has deployed close to 800 personnel to the field. “We stand by the people of Ecuador in this difficult time and are ready to assist in any way we can,” Kerry said. The European Civil Protection Mechanism has been activated following a request by the United Nations to provide assessment expertise. Participating states in the mechanism are analyzing the kind of support and teams to offer, said EU Vice-President Federica Mogherini and European Commissioner for Humanitarian Aid and Crisis Management Christos Stylianides. Ecuador has been rocked by seven earthquakes of magnitude 7.0 or higher in the region of Saturday’s quake since 1900, said the U.S. Geological Survey. A quake in March 1987 killed about 1,000 people.